Marijuana really makes everything better — except for driving. Driving while high could be a deadly mistake, and now there’s technology out there to help monitor safe THC levels on the road. The spreading legalization of marijuana across the United States is exciting and should be celebrated; however, there are some important safety concerns to address. How can we know when someone is too high to drive? It’s not uncommon for smokers to retort that they drive better while high, but in reality, their reaction time is impaired and their driving skills are negatively affected. So how do we keep intoxicated drivers off the road? There are tests to measure cannabis compounds in urine, blood, hair, and saliva; however, these tests can only show whether someone has consumed cannabis within the last few days or weeks, not if they’re currently impaired. Additionally, these tests must be sent to a lab for processing, so they’re not ideal to use during a traffic stop. Law enforcement officers can use breathalyzers to quickly determine the blood alcohol concentration (BAC) of suspected drunk drivers, so why shouldn’t the same technology exist to detect THC levels? Oakland-based diagnostics company Hound Labs, Inc. is one of several companies that have decided to provide a solution. Founded in 2014, they’ve recently completed a clinical trial for their marijuana breathalyzer, which they’re claiming is the very first in the world. They’re currently competing with Cannabix Technologies, Inc., a company from Canada also developing a breathalyzer solution. They aim to eliminate driving and workplace accidents caused by marijuana impairment. A breathalyzer that quickly and accurately reads the THC in a person’s system would be groundbreaking. There are very clear laws in place when it comes to alcohol impairment — drivers who show a blood alcohol concentration over 0.08 are considered impaired. With THC, it’s not that straightforward. There are currently no accepted standards regarding the concentration of THC that causes impairment. While the research is still unclear on how much (if any) THC in your system is acceptable while operating a vehicle, that didn’t stop a handful of states from setting their own limits. States such as Washington, Oregon, Colorado, Montana, Nevada, and Ohio have all passed laws about driving high in wake of their recent legalizations. Some of these states have zero tolerance policies while others have ‘per se’ laws, which require THC in a driver’s system to be below a set limit. 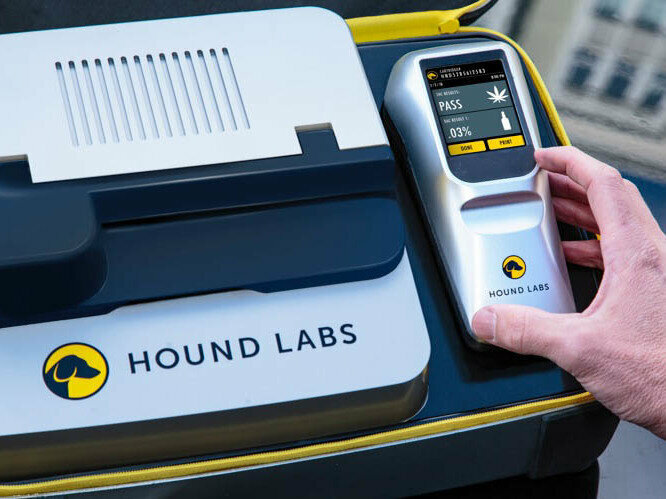 According to Louisa Ashord, marketing manager for Hound Labs, their device “will help ensure safety on our roads and in the workplace while also promoting fairness to people who use marijuana legally and responsibly.” Their breathalyzer works by detecting how much THC is in a person’s system, and, more importantly, how recently they’ve consumed. According to Hound Labs, how recently a person has used marijuana is one of the key determining factors to their intoxication levels. Hound Labs claims that their THC breathalyzer can detect whether a person has smoked cannabis within the past 2 hours. This time frame is what experts call the “window of impairment” and this is when you’re the most high. First, a person blows into the breathalyzer for 30 seconds. The device then begins to measure THC breath molecules in parts per trillion. Currently, alcohol is measured in parts per thousand. Once the breath has been analyzed, an indicator bar displays the results, indicting whether any THC was detected. 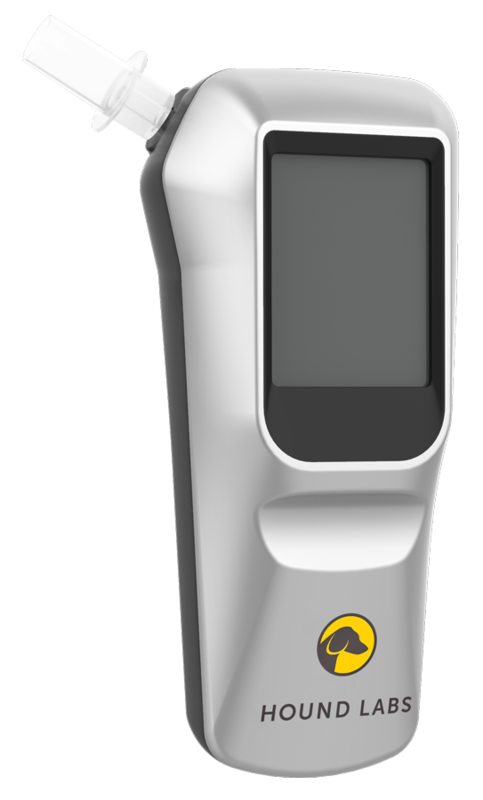 Hound Labs’ cannabis breathalyzer also doubles as an alcohol breathalyzer, making it an exceptionally convenient tool for law enforcement. Skeptics question the accuracy of Hound Labs’ THC breathalyzer. In an interview with Mashable last year, Hound Labs co-founder Mike Lynn was asked about how the devices are being tested. Aside from their own internal testing and a study at UCSF, Hound Labs isn’t letting anyone test the device. Their internal research was not peer-reviewed nor published, and consisted of a small sample size of only 20 people. Additionally, Lynn admitted in the interview that he hadn’t read the study from UCSF. Lynn urges users to test out the devices for themselves once the product is commercially available. But how reliable are these devices? Can we trust them, especially when there is no agreed-upon measurement of THC impairment? Without more extensive, peer-reviewed research, it’s impossible to say. Devices from Hound Labs or Cannabix Technology Inc. seem to be well-intentioned. These breathalyzers are meant to keep our roads safe and provide law enforcement with important information. However, their accuracy and helpfulness are still up for debate. Always drive sober, and keep an eye out for these new devices. Cannabis Career Fair: What Jobs Are in the Marijuana Industry?